The Enterprise returns home to investigate strange rumors and happenings that may threaten the very survival of Starfleet. Before I even start rewatching this one, let me just say it is the only one I have been looking forward to in the first season. This was the first episode of the show to have a real impact on me, and the first one to have me thinking about it long after watching it. It's a little bit different in that it tries to be creepy and even a little scary, and the teaser at the end is haunting. It's also the first time we see a threat to Starfleet itself, which is pretty awesome. Data laughing is great. It's nice that La Forge is still trying to tell him jokes. I love how this episode sets up its atmosphere with that "Code 47" communique with Captain Walker Keel. His refusal to get into details even over a secure channel, and his insistence that nobody can be trusted and nothing can be taken for granted all build up to The X-Files levels of paranoia. That makes me happy. The music is a bit over-the-top. Picard's decision to go directly to Starfleet with his concerns takes some serious cajones. He usually seems exceedingly cautious, but it's good to see him do something bold like that. Though you often see the Enterprise bridge crew cut out communications to discuss something amongst themselves, you rarely ever see somebody do it to them, as the admirals do once Remmick shows his face on the viewscreen. Once Picard says of Admiral Quinn, "At least we know he's still on our side," you know that Quinn is up to no good. Poor Remmick. He seemed like he could have been a redeemable character at the end of "Coming of Age," but alas, he gets infected by alien bugs. With their bad memory, it seems odd that the aliens would be able to function so effectively as Starfleet admirals. It's not just passing off as an existing person, either; they'd have to be able to remember protocol, operational details, political minutiae, etc., not to mention some basics like the English language, tying shoes, and how to go to the bathroom (the vulcan admiral can even remember how to do the vulcan hand gesture). Maybe there's a specific deficit in interpersonal relationships, but that still doesn't make a whole lot of sense when you think about it. They do seem to remember some things, as when Remmick talks about meeting Picard under "less than ideal circumstances" a few episodes earlier, but then Quinn doesn't appear to remember showing Picard his intense anxiety and paranoia over something happening within Starfleet in that same episode. Why does Quinn give up the game so quickly and easily? Riker only seems mildly curious about what is in his case, and then Quinn starts talking about a "superior form of life" and telling Riker that it won't like the science officer. Then he just starts fighting. How did these guys infiltrate the highest levels of Starfleet again? In the next scene, the admirals salute the Horatio and then tell Picard it must have been "the extreme negligence of her captain" that caused it to explode, which is not the best way to avert Picard's obvious suspicions. Then they invite him to a dinner of live mealworms. What kind of strategy is this? How does it make even the least amount of sense? The gill at the back of the neck is pretty gross and creepy. "Doctor, one does not beam down to Starfleet Headquarters armed." Good line. The music in this episode is pretty schlocky, like a cheap 1950's Dracula flick. Stop-motion animation never looks good when paired with live action. In fact, the special effects in this episode are, for the most part, bad. Not as bad as "Skin of Evil," but not a whole lot better either. The climax with Remmick is still completely awesome, even though the effects are lame. How often on 1980's prime time television do you get to see an alien coming out of a steaming, headless corpse? Number of episodes in which an Enterprise crewmember is subverted by an alien influence: 3. Oh, wait, nevermind; Riker was just faking it. It still stands at 2. With more adult eyes, this episode doesn't stand up nearly as well as I remember it. There are numerous plot holes and some mediocre writing, and the whole thing comes across as a slightly amateurish attempt at horror. I like what they were going for--and I acknowledge that the episode is definitely an important landmark in the evolution of the show--but I suppose my high expectations let me down. It's not a bad episode--there have been far worse episodes in the season so far--but it doesn't hold up to episodes like "11001001" and "Coming of Age," which are more polished. As I understand it, this episode--along with the next one, "The Neutral Zone"--were supposed to set up the big alien baddies of TNG to replace the Ferengi, who turned out to be less threatening than originally intended. 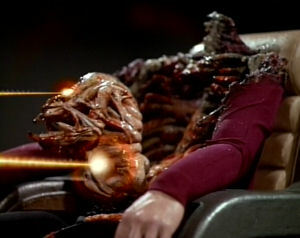 The writers had envisioned an insectoid alien fleet comprised of hives, and the neural parasites in this episode were just the first wave of an enormous invasion. (Actually, there's even more backstory, with one of the original writers wanting this episode to set up a military coup d'état within Starfleet, but that idea was nixed by Roddenberry only to be resurrected later for DS9.) The idea, though, was apparently too big for the show's budget, and the aliens were replaced with much cheaper cyborgs, the Borg. This is why the cliffhanger at the end of this episode is never answered and why we never hear from these things again. Online, I've discovered that the neural parasites are featured in a couple of Star Trek novels, in which it is revealed that they are related to the Trill, but everybody knows the novels aren't considered canon.